Replacing your outdated interior doors is one of the best ways to improve the appearance and value of your home. Interior doors play an important role in your home and you’ll be amazed at the difference a few replacement doors can make. While interior doors are usually tiny details in the grand scheme of your entire home, they also add architectural features and a unique style to your house. As something we use every day, interior doors help tie spaces together visually and enhance your homes background appearance and focus. 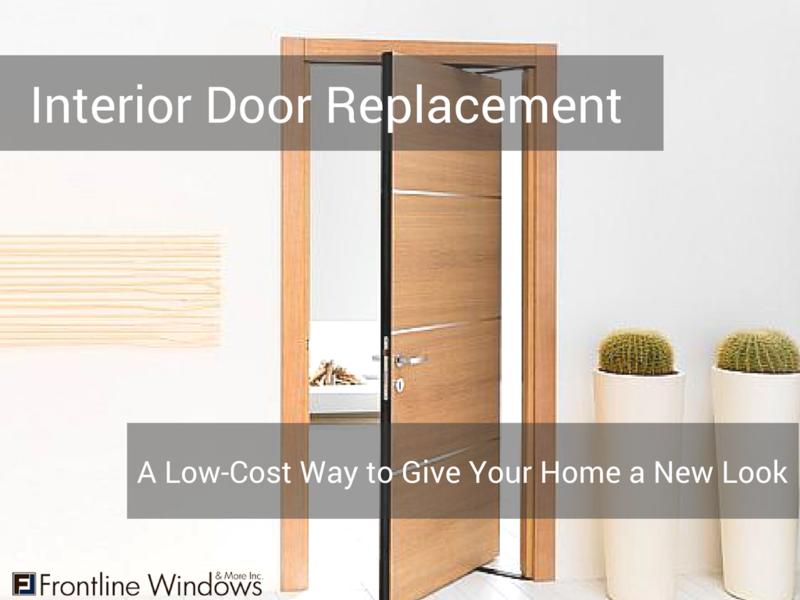 Replacing interior doors offers many other benefits that you’ll want to ensure that you understand before choosing the right interior replacement doors for your home. But first, let’s start by discussing the top reasons to replace or upgrade your interior doors. A mismatch of styles – Consider replacing or upgrading your interior doors if they’re made from different types of materials and painted different colors. If doors in the same area of a home — kitchen, living room, upstairs bedroom, or basement — don’t match, the entire space loses unity. Damaged Doors – It’s worth replacing interior doors if they’ve become damaged or no longer sit properly in their frames. Hollow core-doors are especially vulnerable to damage from bumps and kicks. Too much draft or noise? – If you can see space between the door and the doorframe, the door should to be replaced. You should never feel a draft around the edges of the door itself and there shouldn’t be too much access noise coming from closed doors either. Thin or Non-Insulated Interior Doors – Some contractors and homeowners use inexpensive materials when initially building a home. If your interior doors are very thin, they may not be insulated and this may pose some issues depending on where the door is within your home. Solid Wood Door – Can be made from a variety of hard and soft woods including cherry, mahogany, alder, maple, pine, poplar and others. The most common solid wood door is the traditional 6-panel pine. These doors can be painted or stained to give a classic look to any home. Wood has superior sound-deafening qualities that keep the noise in or out and depending on wood species may be very heavy, giving the doors a stable feeling. Faux Wood Door – Any color tones can be created to mimic any type of wood, like mahogany, walnut, maple, or cherry. Engineered Wood Door – Made from recycled wood fiber. Interior doors made from engineered wood are more stable and durable than wood doors and with a smoother surface for painting than wood. Intricate designs and architectural styling can be achieved with engineered wood and it’s much less expensive than other materials. Pocket Door – Slides into walls rather than swinging open and are a good choice for a smaller space. Bi-fold Door – Like pocket doors, are commonly used in passageways or closets where space is at a premium. Interior bi-fold doors consist of two narrow door panels that are hinged together. Bi-fold doors are available with many kinds of inserts: decorative glass, mirrors, and louvers. Swinging Doors – Doors like these are often associated with saloons and cafes. They are fun, but avoid installing them in high foot-traffic areas because the constant opening and closing “swinging” compromise the door’s durability. Fire-Resistant Door – Can offer up to a half-hour of protection in the event of a house fire and are a great choice for bedrooms. Accordion Door – Great for dividing a room into more people-friendly areas, freeing up floor space, eliminating door fights in tight areas, and helps to reduce distracting noise. While interior doors are important components of your home, ensuring that you select the right replacement doors for your space is vital. From selecting the right hardware to choosing the right style, consider all your options when looking for new interior doors. To learn more about the interior doors Frontline Windows & More offers, please contact us or visit our showroom.